Mimi, Money and Me is a practical, no-nonsense introduction to the realities associated with 101 money-related myths, mistakes, misunderstandings, and misconceptions. The book is instructive, entertaining and light-hearted, and is peppered with “Mimi-isms”—life and money rules to live by—which the author learned from her Mother, Mimi. Guided by Mimi’s teachings and bothered by the realization that so many others have not had the benefit of a parent, teacher or even a friend who could help them navigate around life’s financial roadblocks, Patricia Davis has written a primer on money management that takes some of the mystery out of many of the financial speed bumps you might encounter. 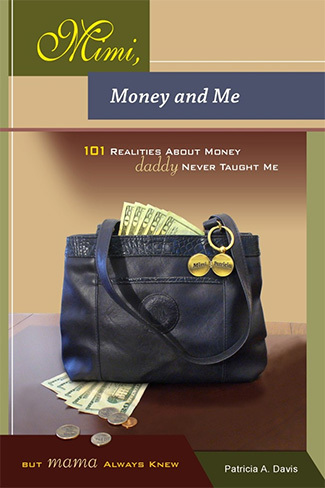 “Mimi, Money and Me: 101 Realities About Money Daddy Never Taught Me but Mama Always Knew,” by Patricia A. Davis (Davis Financial Services, $19.99). This self-published book is a sweet testimony to the author’s mother, Beatrice Staunton, who had to raise the last three of her five children alone after her husband died in 1960. I met Staunton and daughter Patricia when they came to a reception I gave nine years ago for my annual Penny Pincher of the Year contest. Davis channels her mother’s common-sense approach about money by putting together a basic book that includes solid tips on budgeting, banking, credit, insurance and estate planning. You can find this book at Amazon.com. Recent AARP survey shows 35% of baby boomers have been responsible for caring for an aging parent. With the aging of America, that trend will likely increase. 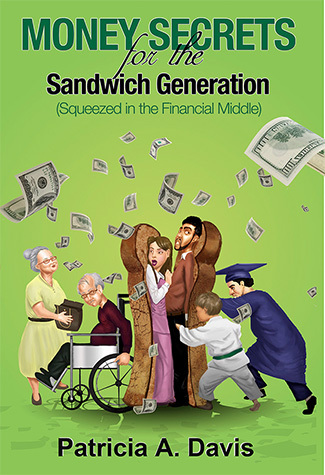 More than I in 8 Americans are members of the sandwich generation. In 1990, only 25% of young adults lived with their parents. By 2000, the number had grown to 52% and continues to rise. Offers tips on a wide range of topics like budgeting, college funding options, student loan repayment programs, how to select a nursing home, when to start drawing Social Security, retirement secrets, calculating retirement needs, reverse mortgages, common money scams, ways to improve your finances and much more! Money Secrets for the Sandwich Generation is a simple book written for those who are simultaneously caring for elderly parents/ grandparents on the one side and adult/minor children on the other. Many are “squeezed in the financial middle” as the two sides tug at both their heart strings and their purse strings. The purpose of the book is to help ease the bewilderment and sense of helplessness many of those traveling down this path sometimes feel by giving them guidance as they make this journey. The book begins with a definition of the sandwich generation—who you are, where you are—and then provides a historical perspective on how you came to be along with a discussion of the outlook for the future. It has lengthy chapters on taking care of yourself first as well as how to care for the other two sides of the sandwich–the older generation and the younger generation. Retirements secrets; information on long-term caregiving; common money scams and how to avoid them; reverse mortgages; and ways to improve one’s finances are all covered in great detail in the book along with pages of useful resources that are sure to lighten the reader’s load. The book is instructive, offers sound recommendations, along with witty advice from both Ms. Davis and her delightful, no-nonsense Mother, Mimi, to whom many of us were introduced in Davis’ book, Mimi, Money and Me—101 Realities About Money Daddy Never Taught Me but Mama Always Knew. At the beginning of each chapter, Davis asks, “What Would Mimi Say?” The answer lies in many of Mimi’s favorite sayings which we all have come to appreciate.